Republicans seem obsessed with the idea that Obamacare is a failure; that it is a "train wreck" exacerbating unemployment. But is that really so? First of all, the claim that the Affordable Care Act is a job killer flies in the face of reality, as Dan Diamond at Forbes reports: Since the law was signed in March 2010, the economy has added 7.7 million jobs, 982,300 of which are in the healthcare field. If Obamacare is a drag on employment, its effect is being drowned by other factors. Of course, the fact that healthcare is gaining jobs at a healthy clip suggests it's not a drag on employment at all. Diamond also highlights important differences between states that expanded Medicaid and those which did not. He cites a Colorado Hospital Association study of 465 hospitals in 15 expansion states and 15 non-expansion states, which show sharply divergent patterns in the two groups on the number of people seen at the hospital without insurance, and the volume of charity care per hospital. Here is his chart, a selection from that available in the CHA study. As we can see, hospitals in both expansion and non-expansion states were seeing between 4.5% and 5% uninsured quite consistently in 2012 and 2013. (Note that the study did not include Texas or California, the biggest state in each category, both of which had high overall uninsured rates.) In the first quarter of 2014, as new insurance began to kick in, there was an immediate drop to 3.1% in the expansion states, while the figure actually edged up in the non-expansion states to 5.0% from 4.8% a year previously. For charity care, there was already a noticeable difference between the two sets of states over 2012-2013, where hospitals in expansion states provided an average of $3 million in charity care per quarter vs. about $4 million in non-expansion states. Again, we see an immediate improvement in the expansion states in the first quarter of 2014, falling by about 1/3 to $1.9 million, compared to a slight increase in the non-expansion states relative to the first quarter of 2013. Meanwhile, rural hospitals are closing in non-expansion states, prompting the Republican mayor of Belhaven, North Carolina, where Vidant Pungo Hospital is closing, to call on the state to accept the Medicaid expansion made optional by the U.S. Supreme Court's ruling that upheld the ACA's individual mandate. In another post, Diamond underlines other dimensions of Obamacare that usually go under the radar. Perhaps the most powerful, but rarely discussed, effect is that on healthcare quality. Diamond catches a December 2013 study from the Centers for Medicare and Medicaid Services (CMS). As Diamond explains, one early ACA initiative allowed CMS to reduce Medicare payments to hospitals that had high re-admission rates, which is generally an indicator of poor care. Specifically, as the study says, re-admissions within 30 days "often means there have been unclear instructions to patients or lack of follow-up care." 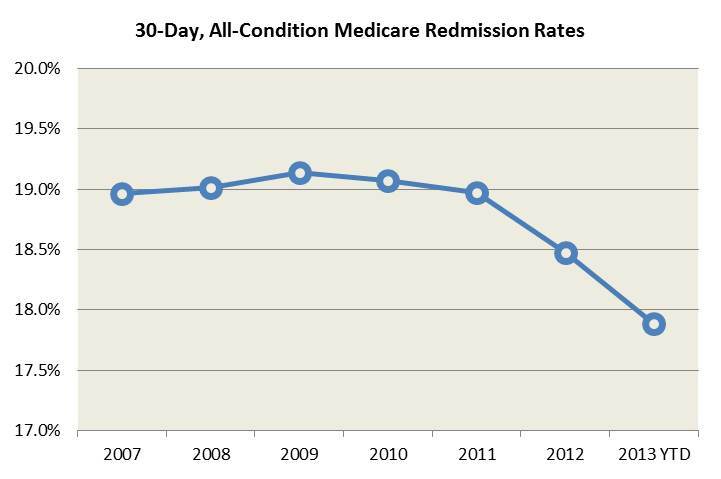 Here is the 30-day re-admission rate for Medicare from 2007 through August 2013. As we can see, there was virtually no change from 2007 through 2011. But in 2012, the rate fell by a full half-point, and by even more than that in the first eight months of 2013. As Diamond points out, this is pretty hard to spin as anything but a success for Obamacare. He also provides a map from the study which shows that virtually the entire country had an improvement (see link to the study or his article). In only six states were there any areas seeing worse performance, defined as an increase of over 0.25 percentage points. Numerous states saw increases in all of their CMS regions, and plenty of regions saw improvements greater than 1.5 percentage points, including Las Vegas, Memphis, and almost all of Kansas. Finally, let's look at the issue that has dominated the discussion: Are more people actually insured? Paul Krugman sends us to the Gallup poll on the percentage of uninsured Americans. The poll, based on more than 30,000 interviews in April and May, showed that the uninsured rate dropped 3.7 percentage points for all adults from the 4th quarter of 2013 to April-May 2014 (see graph below). It dropped 6.2 percentage points for African-Americans and 6.0 points for those with an income below $36,000. The best estimate of total ACA enrollments continues to come from Charles Gaba at ACAsignups.net, who estimates a range from 23.6 to 28.2 million gross enrollments. Finally, don't forget the PP in PPACA, patient protection. Everyone can now get insurance regardless of pre-existing conditions, no one can have their insurance canceled because they get sick, and no one has annual or lifetime insurance caps anymore. Indeed, these factors may well lead us to see a decrease in the country's bankruptcy rate, as medical bankruptcies become less frequent. Obamacare not working? Don't believe the hype. "Of course, the fact that healthcare is gaining jobs at a healthy clip suggests it's not a drag on employment at all." Of course it is, it means that people are getting the care they need.